Though we’ve created more productivity tools and strategies than ever, many people are frustrated that they’re not making progress on what’s most important to them. We’re to-do list ninjas, knocking off task after task but doing less of what really matters. 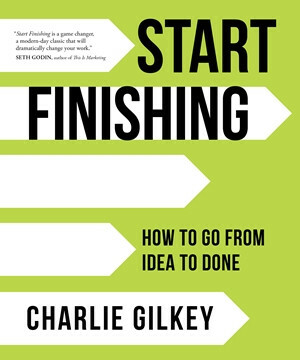 With Start Finishing, Gilkey presents a systematic, root-cause approach for overcoming the real pitfalls to productivity and turning your ideas into finished projects. He outlines a powerful seven-step method for success—including identifying your genius, building a success pack of supporters, navigating multiple projects, and using each completed step to create momentum that propels you toward your larger goals. With deep insight and clarity—and contributions from Seth Godin, Susan Piver, Jonathan Fields, and more—Gilkey provides an invaluable set of tools to help you stop being bogged down with task lists and start finishing your best work.